AH, FALL, CAN WINTER BE FAR BEHIND? The days are getting shorter, colder, and drearier; I wish spring and summer could last forever. Fall and winter have their good sides, too. Right now the leaves are turning red and gold, and we are having pine needles rain on our lawns. 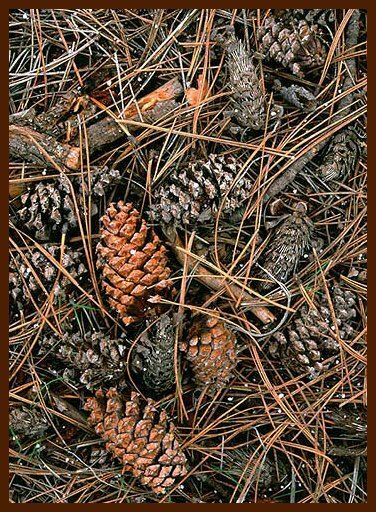 Soon you will see the piles and piles of pine needles raked and stashed at the side of all the roads in our mountain haven. I have been told that they are good for the soil and should be left in place, but I still rake them, much to the chagrin of my muscles. We just went through a week end of cowboys and wannabes. 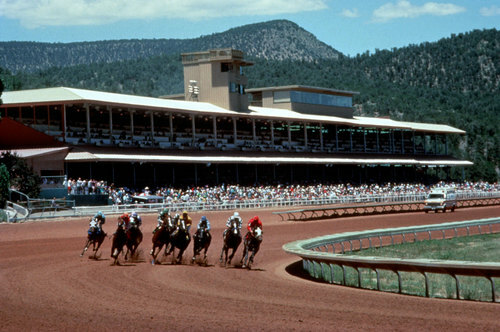 The Cowboy Symposium was held at the Ruidoso Downs Racetrack, which luckily will still remain open, thanks to the many voters who supported the tax issue. I still prefer to see race horses; I’m not into cowboys. The Oktoberfest is on its way, and its always a lot of fun. My hubby and I would always attend the events held at the Convention Center; for one week end we became Germans. I haven’t attended since his death, all those goings on have lost their appeal to me, it’s not fun being alone. With my job, I find the days and weeks flying by; I am so thankful that I have it. I now am eager to get home everyday to my pooch, and I find consolation in the fact that somebody still needs me. He is always so happy to see me, but I sometimes suspect its also because he is hungry and knows that I will feed him. I really felt alone yesterday when I had a scary hour or so. I was sitting down for breakfast when my right nostril, out of the blue, starting bleeding, and I could not stop it, no matter what I did. After half an hour, I started panicking, should I go to the hospital, was it serious. I decided to stuff some Kleenex up my nose, and sat down at the computer, searching for cures for nosebleeds. It turns out that the best solution, which worked for me, was to pinch the nose for ten whole minutes, while putting a cold pack on the nose and cheeks. Not having an ice pack, I settled for the nearest substitute, a frozen package of peas! After the ten minutes were up, I slowly unpinched the nose, put a dab of Vaseline up the nostril, and the bleeding had completely stopped. I was thankful for that. It did bring closer to home the precarious situation of being alone. The son that lives here is always telling me to call him if I need him, no matter what time. I almost took him up on it. Hug your loved ones close today and everyday. You never know when they will no longer be there. 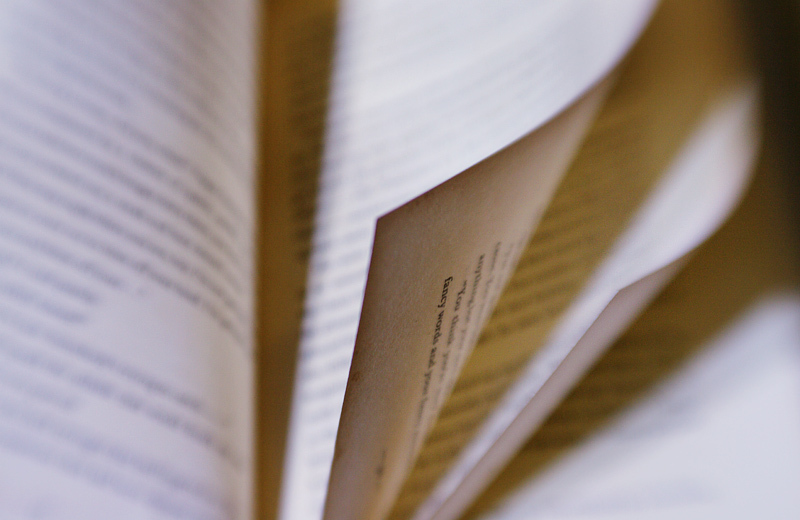 Each day of my life now seems like a newly purchased book; I am eager to start that first page and find new adventure and perhaps some mysteries; I am, after all, one of the biggest readers of mystery novels, next to my sister. Before I begin on my page of the day, let me reveal to you about the “lending” library that she and I have. I purchase a book, read it, and send it to her. She does the same, but the books she returns seem to have multiplied like bunnies; I send her three, she returns twelve. That mystery is solved when she explains that her daughter, also an avid reader, sends her novels she has purchased and read, so I end up with shopping bags full of books. Before I began my new job I could finish a book in two days, and after compiling those, I would travel to my local paperback exchange, and return with even more books. My reading has slowed down a bit, as I have my days filled now with my new job. This is when the new pages of my life begin; I actually look forward to getting up in the morning with my day scheduled for work. I never knew how much I enjoyed working until I no longer had a job. There is just so much you can do around the house, and when those chores are finished, the rest of the day looms ahead. I volunteered with my local Democratic Party, something my hubby and I did together, he was such an avid Democrat. When his illness progressed he could not do as much, and I preferred to keep him company, so my volunteering dwindled. I am just beginning to get back in that groove. Each day brings new things into my life, new people I can talk to. When I was home alone my conversations were mostly with my pooch, who listened intently, and agreed with everything I said. He was, and still is, my constant companion, being privy to my saddest moments, sharing my tears with him, and also my happy thoughts. I hurry home to him at noon, let him out in the yard, have my lunch, play with him a bit, give him a “dental” treat, and leave. In the evening, the same schedule follows; he demands more petting now since I am gone for the day. My new pages are now filled with the wonderful views of the beginning of fall. The days are quite cool in the mornings and evenings. We had the annual motorcycle rally last week in our village, and the roar of the “motos” were heard everywhere, and you have not seem anything until you view the hundreds and hundreds of bikers filling every inch of space in your town. They are all welcomed, but you can hear the combined sighs of relief when they leave; we have the serenity back. So, life goes on, and I float along with it. 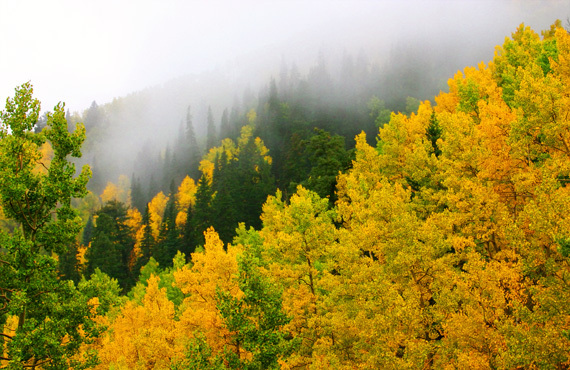 Next week will be the annual Aspencade weekend, when the leaves are beginning to turn to the lovely golds and reds. Come see it with me.